Space Engineers is a lot more than just Minecraft in space, but to be honest I haven’t played Minecraft with all of the crazy mods currently available so maybe it is more similar than I realize. Right now the game is still in “Early Access” stages but Keen and I both really love what we have experienced so far. There’s a lot I can talk about so I’m just going to break down some of the really cool aspects of the game. Gravity – There is no gravity in Space Engineers unless you build gravity generators. You get a fancy jetpack that lets you zoom around and control your positioning, but that doesn’t do a whole lot to help you when drilling into an asteroid. All of the chunks you break apart will go flying off in all directions which forces you to desperately try and fly after them. Some people probably think that this doesn’t actually sound enjoyable, and it isn’t, but it does force you to come up with creative options. The easiest thing that we discovered was to extend the gravity field that is generated by your starting ship and park right above the spot you want to chip away at. It was really satisfying to come up with a solution to that problem. 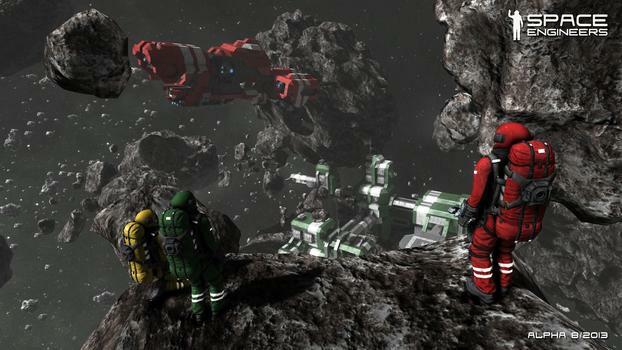 Mining, Processing, & Assembling – Everything in Space Engineers requires some kind of raw material. I’m not sure exactly how many different kinds there are but so far we have encountered rock, iron, silver, gold, platinum, magnesium, uranium, cobalt, and probably one or two more that I’m forgetting. Once you collect some of these materials you can process them in a refinery. Once you have refined ingots, or whatever, you can use an assembler to create components like construction pieces, metal plates, computers, displays, etc. All of those objects are then used when creating the various pieces of ships and stations. Building Stuff – When you start building something you get to choose whether you want to make a small ship, large ship, or a station. So far we have only experienced making a small ship since the larger variety, along with the stations, require a ton more materials. You can configure the ships anyway you want and really the only things they need to fly are a cockpit, power source & fuel, and thrusters. You can build the rest of the ship however you want. The light and heavy armor blocks come in a few different shapes (block, wedge, corner) and can be used to make up the framework of your vessel along with being used to protect vital pieces like the reactor. You need to put some thrusters on all six sides of your ship (front, back, left, right, up, down) so you can control which direction you fly and you will also need a gyroscope to control pitch and rotation of your ship. At least that’s what I think it does since I honestly don’t know what else would. There’s also a large number of other things you can add to your ship like conveyor pieces, storage, gravity generators, medical stations, drills, lights, detectors, weapon fixtures, collectors, and so on. Lots of cool stuff. Destruction – Everybody loves breaking stuff or watching large objects crash into other large objects and Space Engineers is full of that stuff. Any time something hits another surface too hard it will dent or warp or even break off completely. So when maneuvering your ships around if you aren’t careful then you are going to dent the heck out of that thing and probably lose a few components along the way. Right now in the game there are also meteors/comets (or whatever the correct term is that I’m sure somebody will correct me on) that can be toggled on and off. I think the settings are something like off. normal, <something I forgot>, and ARMAGEDDON. I like the idea of having to be wary of random pieces of rock hurtling around and possibly hitting you but I’m not sure how well this is working right now. On the normal setting, which is the only one we have experienced, it seems like the things have homing devices attached to them because they will go out of their way to crash into all of your stuff. You can start out on a space platform and within the hour at least half of it will be gone. I think they might need to tinker with that, especially since I can’t really think of any viable way to protect myself from this unless I exclusively build INSIDE large asteroids. Potential – There is so much that they can do in Space Engineers and so much that they have said they will do. I think Keen mentioned he heard there will be NPC factions and some other cool stuff added. Personally, I’d love to see more stuff like that and NPC interactions. Lightspeed travel to other sectors would be cool as well. Maybe more ship and station components and even some additional engineer tools would be really awesome. I’m excited to see what is in store for Space Engineers. 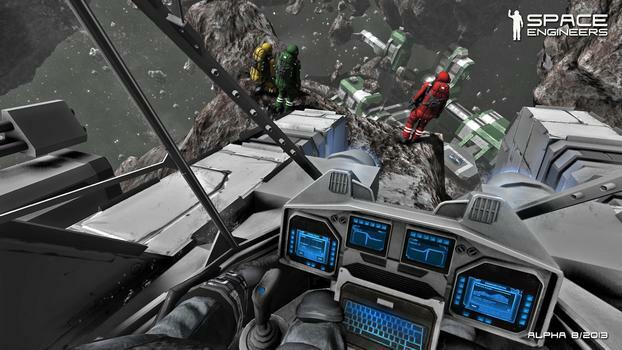 You can buy Space Engineers on Green Man Gaming for $19.99 (activates on Steam) or straight from Steam itself. I don’t know what term they use in game, but the correct term would be meteoroid. Great write-up. I have played a bit of it but I need to sit down and actually learn to play more than pop in and jetpack around for a bit.